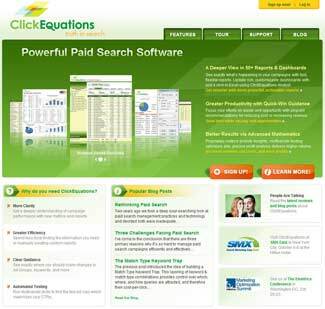 We’re pleased to announce that the new www.clickequations.com website is now up and running. The site provides more information about our upcoming ClickEquations software release, an initial feature list (there may be some more details released in the future), and a new larger version of our 5-minute video demo. And you can sign up for an invitation to get pre-release access to ClickEquations to manage your PPC campaigns. News about our upcoming trade show appearances (we’ll be at SMX and Emetrics, for example) is there, and more. As with any new site (or old site for that matter) it’s a work in progress, and we have more planned. But it’s nice to have a shiny new home on the web.